Coastal Veddas, such as these of Panichankerny, speak Tamil yet still cherish their ancestral identity as hunter-gatherers. The emergence of rivalry between ethnic groupings living side by side in the same country do compel each ethnic group to get involved in a vain search for their supposed authentic roots in that land to prove their claim as exclusive sons of the soil. In Sri Lanka Sinhala and Tamil communities now are involved in an ethnic conflict, are also rabidly searching their heritage and roots to establish each one's exclusive claim over the other as sons of the soil. Those who are familiar with the Old Testament may recall that the chosen people occupying Canaan created a false history to establish their bogus claim as sons of the soil of Canaan. They who were occupants created a history for them to legitimize their Canaanite nationalism and establish their authenticity to claim the Canaan heritage. They even dared to brazenly steal many things from other peoples' cultures, religions and histories, thus unleashing a brutal ethnic cleansing. In the same way the stealing of histories and vain attempts to impose upon other's heritages continues to this day. Within this phenomenon the visible enterprise is the endeavour to establish one's claim as sons of the soil (very patriarchal concept). Within these immoral and unethical pursuits of the two major ethnic communities in Sri Lanka, Sinhala and Tamil, the Veddas of Sri Lanka, who are undoubtedly the original ‘sons of the soil', remain mercilessly squeezed. Veddas, the indigenous peoples of Sri Lanka, are abused by both ethnic communities seeking to safeguard their own vested interests. Sinhala nationalists at present have capitalized upon false organic links to Veddas to establish their bogus claim as sons of the soil of Sri Lanka. However, they conjure their links only to Bintenne Veddas as it supposes Bintenne Veddas to be the only pure Veddas of Sri Lanka. Perhaps they (Sinhala nationalists) may not be aware that there exists Veddas on the East Coast too. This paper is an endeavour to make known the East Coast Veddas' existence. As a pre-qualification to this paper, it is necessary to state that, in the same way that Sinhala nationalism is abusing Veddas to establish their bogus claim as sons of the soil of Sri Lanka, the Tamil nationalists are also abusing East Coast Veddas to prove their own heritage to Sri Lanka. A leader of the Vedda community Mr. Uruvarige Vanniyalaththa made a statement regarding the corrupt elections of Sri Lanka. Due to his statement, overnight he became a prominent figure in both printed and electronic media. Can Uruvarige Vanniyalaththa or his father be called the true leader by descent of the indigenous peoples of Sri Lanka? Seligmann gives us some clues on this subject. A number of other so-called varige of minor strength and importance, which perhaps may be local groups that have forgotten their origin and have assumed a name (sometimes obviously a place-name) as a convenience. The Bintenna Veddas are not just a preserved indigenous community, but they are used by the Sinhala ethnic community as a historical basis/link to legitimize their claim as original peoples of Sri Lanka. Present day Veddas of Sri Lanka are considered to be a non-violent community who maintain cordial relations with the people living in nearby urban or rural areas. However, many groups belonging to the Vedda community remain marginalised. The popular interaction is limited mainly to Dambana and Uruvarige leaders. Media highlighted the visit of the so-called Vedda leader to the Temple of the Tooth Relic, etc. Numerous interactions with the government were reported. Many researchers have provided evidence that there are Veddas in the eastern coast as well who show behavior patterns similar to other Veddas. Less research has been conducted on Sinhala-speaking Panama Veddas of the East Coast. At the same time some unique behavior patterns too have been observed. Sinhala nationalists insist that the Vedda community should be preserved as a community so that they (Sinhala nationalists) could portray them (Veddas) as the exclusive heritage of Sinhala Buddhist culture. Sinhala nationalists try to relate Veddas to the historical origin of the Sinhala nation and pose close ties with them. They have even attempted to ordain some Vedda children as Buddhist monks. These nationalistic groups feel Buddhism must be introduced to and followed by the Veddas instead of their own folk religions. They are, however, against other religions reaching the Veddas. Similarly, Tamil nationalists too are interested in assimilating East Coast Veddas into the Tamil community and Hinduism to maintain their dominance over them. The present day Sinhalese of the Vedi Rata say that such Vedda chiefs as those here recorded were called wanniya and repaired annually to Kandy with offerings of honey, wax, and vension for the king, who might also invite their presence on special occasions when they would attend, each wanniya bringing with him a ceremonial fanlike ornament (still used by the Sinhalese chiefs) called awupata (literally ‘fan'), with an ornament made of wood or ivory on the top called koranduwa, or kota. Actually the king's palace has been replaced by the Dalada Maligawa. This tradition, today is wrongly practiced when so-called Vedda chiefs visit Dalada Maligawa with honey, wax and other offerings. Further, the Vedda chief has been honoured with special thevawa for his loyalty to Dalada Maligawa. "The impact of state developmental schemes such as the accelerated Mahaweli Development Programme on the Veddas of Mahiyangana was the cause of interest for this study. This study focuses on the question of identity in terms of their marginality in relation to the dominant ethnic community, in the east coast the Tamils." Tamil nationalism attempts to integrate the Vedda community as Tamils. The data is based on 1911 census. The number of Veddas is stated as 5342 during that year. For the purpose of the census, a Vedda is defined as a hunter-gatherer by occupation having knowledge of Vedda religion. Running through the census is this thread of the definition and identity of a Vedda. The different definition of a Vedda in the different periods has lead to variation in the size of the Vedda population. According to the census estimates, the identity of a Vedda is imposed from outside sources. It defines a Vedda as anyone who identifies himself or herself to be one. This approach must be borne in mind in view of the question of assimilation of Veddas. Preliminary studies among the various villages indicate that East Coast Veddas refer to themselves as Vedavellar or Vedar. The knowledge of varigae was also tested through the questionnaire. Vedavellari: a lotus and a bow and arrow symbol is used. Motukaduvedar: the symbol of laterally jointing bow and arrow is used. Kuranguthinnivedar: an upwardly pointing bow and arrow is used. The transition of identity between the three generations is striking; the older generation refer to themselves as Veddas, while the younger generations do so only to a much lesser extent. In Nasiventivu the first generation refer to themselves as Vedar. The suffix Velallar is added to distinguish them from those involved in fisheries such as the Vedar from Kaluwenkerny. The need for distinction especially arose in situations such as Temple festivals and the right to perform certain ritual functions. In Mankerny people of the entire older generation refer to themselves as Veddas. All first and second generation respondents were familiar with the term varigae in Mankerny. Varigae is a term that denotes the identity of the clan. This is similar to a sub-caste. The familarity of the term vanigae is observed in the first and second generations of Kaluwenkerny and Nasiventivu communities. The use of this term is unheard of in the village of Parankiamadu. "The religion adopted by the East coast Veddas range from traditional Hinduism to the worship of gods peculiar to the East Coast Veddas. Persons involved in religious ceremonies are more knowledgeable about traditional Vedda gods. 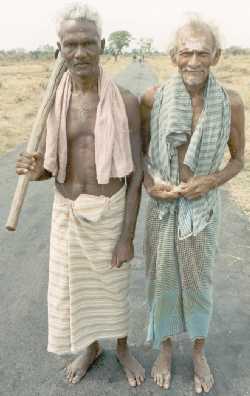 Such persons are referred to as Puccariyar or Teyvanthu kuniavar. The gods worshiped by the Veddas in the villages surveyed can be divided into three broad categories." "These includes names sucn as Chenpaganachi, Chenpagavanniyan, Veda Teyvam and Kappan Teyva Chenai Vairavar is another god associated with Chena cultivation. Chena cultivation uses no fences to keep off wild animals. Various other methods such as keeping branches kotthu (twigs) and the god Chenai Vairavar is used to ward off wild animals. "The second category is the range of small gods usually worshipped by the older generation. This includes Vairavar, Narasinga Vairavar, Sudalai Vairavar, Veerapathiran, Pathia Kali." "The gods belonging to the broader Hindu pantheon such as Pilliyar, Murugan, and Mari Amman are worshipped by the second and third generations." 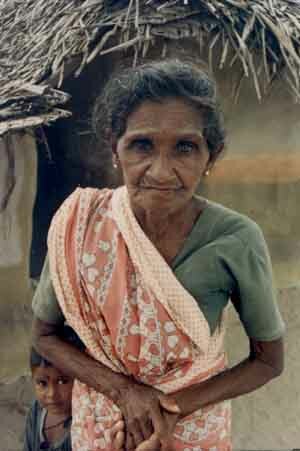 There is a general acceptance of the Vedda community as one with a unique identity. The inter-generational transformation has been harmonized with the overall development strategies of the country. The Vedda community has responded well and spiritually to the transformation. The initial attempts by the British and by subsequent administrations to wean Veddas away from chena cultivation has not had an economically positive impact upon Vedda communities. They have always been marginalized and arising out of that marginality they have remained a community on the fringe. With the subsequent generations the status has been determined by their relative status of proximity to the Tamil community. If they were identified as Tamils, then they were able to be integrated into a higher status and a ‘better' way of life. Thus, there was a general tendency for their identity to migrate from Vedda to Tamil. This paper establishes beyond reasonable doubt that there existed Veddas in the East Coast apart from the Bintenne Veddas. Thus evolutionarily the Veddas are the indigenous people of Sri Lanka. The Veddas are aborigines and have their organic links to Negroids, the biological sub-grouping of homo sapiens. The Sinhala and Tamil communities who emigrated from various parts of India colonized Sri Lanka over the centuries and are today very crudely trying to suppress each other for authenticity. But they forget that they came from India or other parts of the world, and because of their existence in Sri Lanka the indigenous people therein the Veddas are denied their identity and heritage. In fact, Veddas have become the victims of both Sinhala and Tamil nationalists in their mutual objective of artificially claiming roots in Sri Lanka.